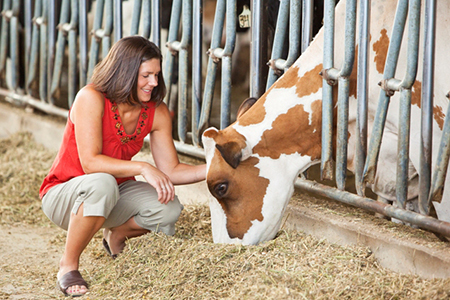 Editor’s note: This guest blog was provided by our sponsor, Western Dairy Association. Scientific and technological advances, in addition to on-farm sensibilities have allowed for better animal care, more precise farming practices to decrease inputs such as land, water, fuel and feed, and improved efficiencies to produce more with less. Compared to1944, the U.S. dairy industry now produces a gallon of milk using 90 percent less land, 65 percent less water, 76 percent less manure and a 63 percent smaller carbon footprint. Additionally, dairy cows are efficient at feed-to-food conversion. Cows can recycle food that humans can’t eat – the by-products from the human food and fiber industries such as cottonseed and wet brewer’s grain are converted to milk rather than sent to landfills. In fact 75 percent of the cow’s diet in the U.S. is not consumable by humans. Furthermore, cows also produce manure which, when recycled as a fertilizer for crops, helps maintain soil fertility and enables the cow to return most of the nutrients from her feed back to the land. In July 2010, the Innovation Center for U.S. Dairy completed the first national carbon footprint study of fluid milk – measuring greenhouse gas emissions for fluid milk from crop production through disposal of the gallon jug by the consumer. The study, along with data from other sources, validates that total U.S. dairy industry greenhouse gas emissions are approximately two percent of total U.S. emissions. According to the study, the use of best management practices, rather than size or location of the farm or processing facility, makes the biggest difference in reducing emissions. As the population grows and resources become more scarce, it’s not just food that’s needed, it’s nutrient-rich food. The dairy food group is an important source of nutrients in the diets of Americans – at only 10 percent of the calories consumed. In fact, milk alone is the number one food source of three of the four nutrients of public health concern in Americans’ diets – calcium, potassium and vitamin D.
The journey to sustainability is a number of small steps that add up. The next time you enjoy a glass of ice-cold milk or creamy yogurt, remember how hard your local dairy farm families are working to take care of their animals and preserve Earth’s natural resources all while providing a nutritious food to feed the world. To read more about dairy’s commitment to sustainability and the work currently be done by dairy farm families across the country, visit www.usdairy.com/sustainability/industry-commitment and checkout the 2013 Dairy Sustainability Report.